Balancing Hawai‘i’s water is a constant tug-of-war. Diamonds and oil may be among the world’s most expensive commodities, but even they are worthless without water. Water sustains cultures and countries in our growing global population, and, although it may not always carry a price tag, it is undoubtedly the most valued resource on Earth. Hawaiians understood the importance and value of wai long before Europeans arrived. It was respected and managed as a kinolau, or physical embodiment, of the god Kāne. As an essential source of life, wai stretched mauka to makai through ahupua‘a—from the wao akua, realm of the gods, to the wao kanaka, realm of humans. Being so integral to the lives of all, Hawaiians believed water was a gift to be shared by everyone. The first written laws of this isolated place in the Pacific incorporated traditional Hawaiian values, even with the presence of foreign influences. Everyone was expected to share the water. These values were still recognized after the Māhele of 1848, which introduced a system of private land ownership to the Islands. But it was during Hawai‘i’s sugarcane era, historians say, that water laws strayed farther from traditional Hawaiian principles and treated water as a commodity: sugar companies began diverting water as quickly as they acquired land. Large portions of ‘Īao Stream have been left bone-dry by diversions. Photo by Ed Greevy. All rights reserved. Much of that changed once Hawai‘i became a state in 1959. Like other states, Hawai‘i’s water and natural resources fell under the protection of the oldest, most deeply anchored body of law, the public trust doctrine. Eventually, Hawai‘i’s Constitution established a state agency tasked with protecting water, the Commission on Water Resource Management, while more protection came via a state water code. Many called this cutting edge for any place seeking water protection. But, with the decline of the sugar industry, which left abandoned sugar lands and diverted water up for grabs, other private interests began to step in, challenging the public trust and water code with each drop of diverted water. Half a century has passed, and the story continues today. About 90 percent of Hawai‘i’s streams are currently diverted, pitting Hawai‘i’s wettest places against the driest in a downstream tug-of-war for water. But no matter how rough the waters, those involved in past and present disputes continue to look to the future represented by our keiki. Like sponges, they absorb the waters of wisdom kūpuna share and, in doing so, learn to preserve wai and perpetuate the culture. The Nā Wai ‘Ehā case on Maui has given some hope to this way of thinking. 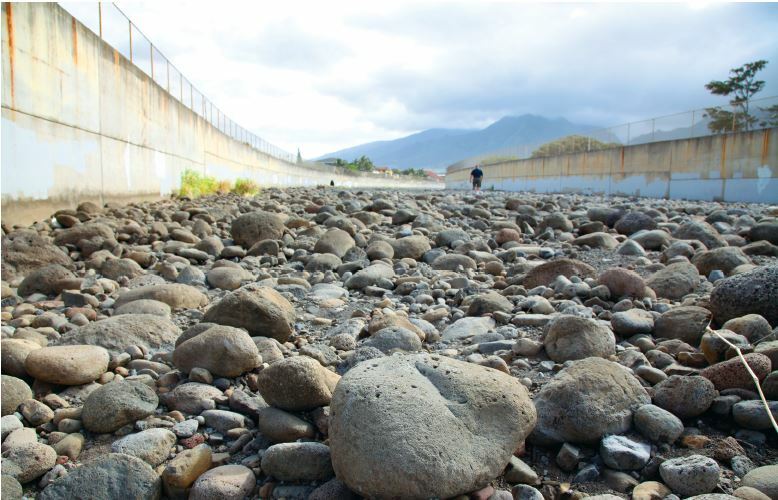 After a nearly decadelong battle, water finally flows mauka to makai for four of Maui’s arterial streams. A settlement in April 2014 restored significant amounts of water to Nā Wai ‘Ehā, The Four Great Waters of Waihe‘e, ‘Īao (traditionally Wailuku), Waiehu and Waikapū. Prior to this, two of the four streams remained dry. “We crossed a really monumental threshold in that all four streams will be flowing once again,” said EarthJustice attorney Isaac Moriwake, who represents Maui community groups Hui o Nā Wai ‘Ehā and Maui Tomorrow Foundation. The settlement returned up to 10 million gallons per day (mgd) of water to ‘Īao and 2.9 mgd for Waikapū. 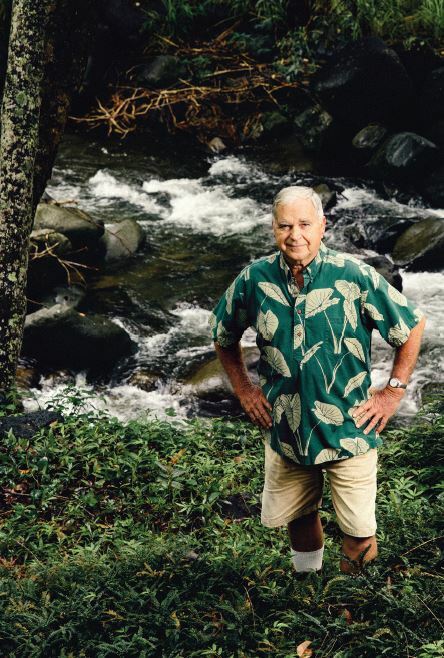 Longtime ‘Īao Valley farmer and familiar face in the Nā Wai ‘Ehā case, John Duey stands in front of a section of ‘Īao Stream that still flows. Photo by Ryan Siphers. All rights reserved. “There is still an underlying question whether the water, which is held in trust, can even be sold in the first place, but we really haven’t tackled that issue yet,” said Moriwake. Many have looked to Duey as an expert on water because, for years, he repaired and installed irrigation systems throughout the county, becoming familiar with many of the water diversions. At one point, he also took the lead in the issue as president of Hui o Nā Wai ‘Ehā. Today, he says, the story is no different than it was 50 years ago. The diversions have continued to negatively impact Hawai‘i’s communities and ecosystems. The recent settlement, Duey says, will hopefully remedy this and set a precedent for other communities. Since Maui community groups first took legal action in 2004, about 12.5 mgd of the overall 70 mgd diverted have been restored to two of the four streams. Waikapū and ‘Īao remained dry. A high court ruling in 2010 ordered the commission to reconsider the fate of Nā Wai ‘Ehā and, in doing so, reinforced that the public trust is law. “This is the first time a [water-related] case has been settled through discussions and negotiations,” Moriwake says. HC&S would not comment on the case, but said, “There is no single factor more important to keeping [their] 36,000 acres of sugarcane healthy … than water.” According to HC&S, it uses an average of 200 mgd for irrigation to support its crop. That water not only supports sugarcane but also 800 jobs, and contributes $250 million to Maui’s economy each year. Those with kuleana rights have been attached and connected to parcels of land from the time of the Māhele. Their ancestors were charged, then, to cultivate and take care of the land, a responsibility that has been passed down through generations. Hence, the lands continue to be legally recognized and, thus, protected. Alyssa S. Navares Myers’s article “In Wai We Trust” appears in its entirety, along with 19 other previously published MANA Magazine articles, in the anthology MANA: A Journal of Hawai‘i. Original publication: Sept/Oct 2013 issue. All rights reserved. No part of this book may be reproduced in any form or by any electronic or mechanical means, including information retrieval systems, without prior written permission from the publisher, except for brief passages quoted in reviews. Articles excerpted here appear in their entirety in the anthology MANA: A Journal of Hawai‘i. All rights reserved. No part of this book may be reproduced in any form or by any electronic or mechanical means, including information retrieval systems, without prior written permission from the publisher, except for brief passages quoted in reviews.